I'm back after a long break from blogging! Had an eventful June/July period, the most significant of which was the trip to Taipei! 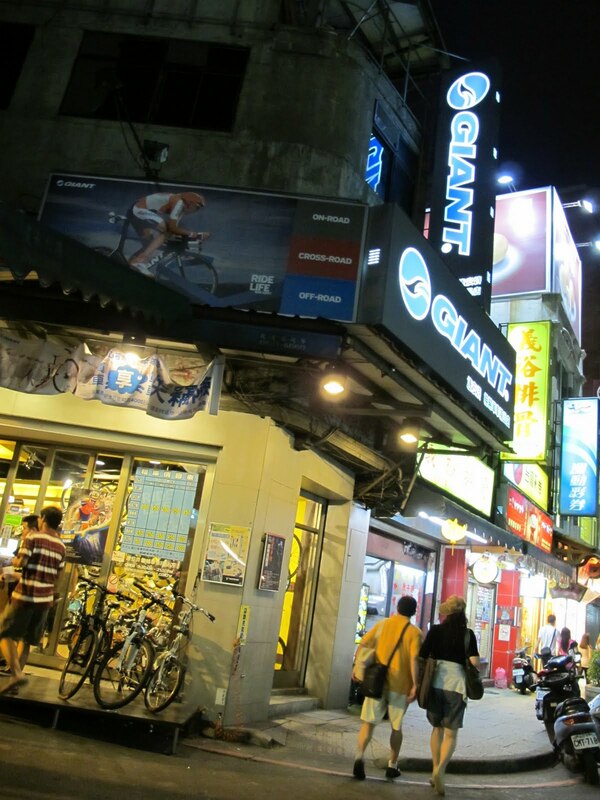 Taiwan is the land of bicycle manufacturing, where most big brands base their operations. 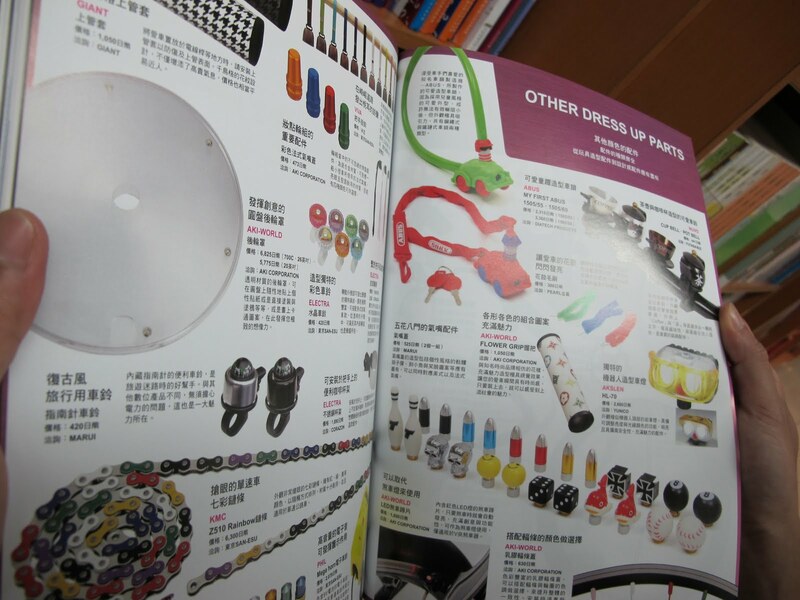 Naturally there will be many bike-related industries, such as bike accessories, modifications, customization services all around. Just in Taipei alone there are so many bike shops, but most of them are small shops. Very few large shops, and even fewer large folding bike shops. 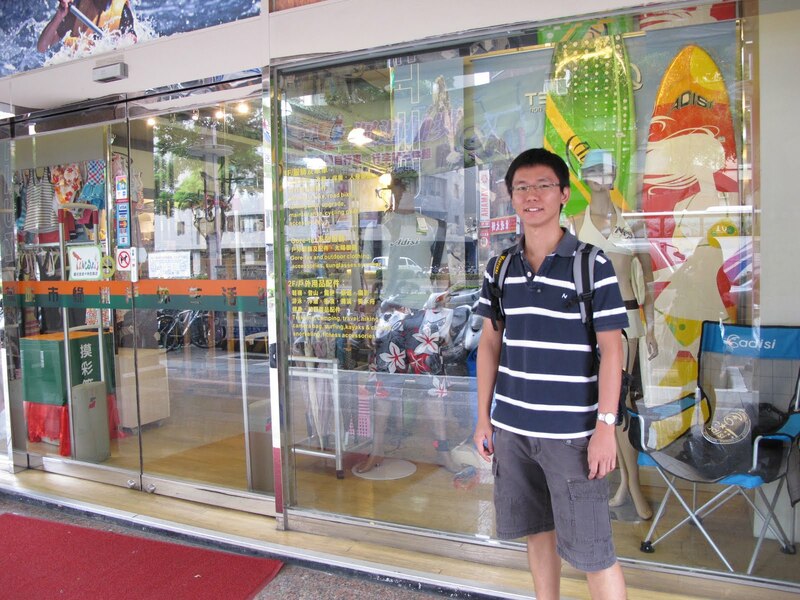 I had identified a few larger shops in Taipei to visit. Also happened to pass by some bike shops which I did not know was there. 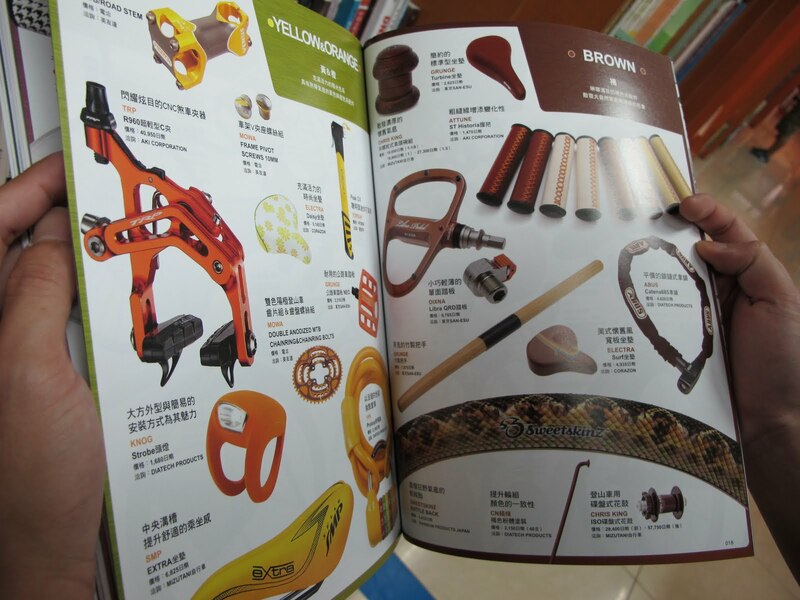 The shops are rated according to 3 criteria: Range of accessories, Accessibility and Variety of folding bike stuff. The stores below are those which I feel are worth going, be prepared to get poisoned! Bike shop at 淡水老街. Good to rent bikes from here to cycle to 渔人码头. There is another bike shop, 八里羚羊車店（蒞達自行車行）, which is apparently quite good with a wide range of Dahon bikes and other brands. However it is not near any MRT station, thus we did not pay a visit to it. Although it should be quite easily accessible by taxi. The address is 台北縣八里鄉頂寮三街16號. Accessories: ?/5, Accessibility: 2/5, Folding bike stuff: 5/5? 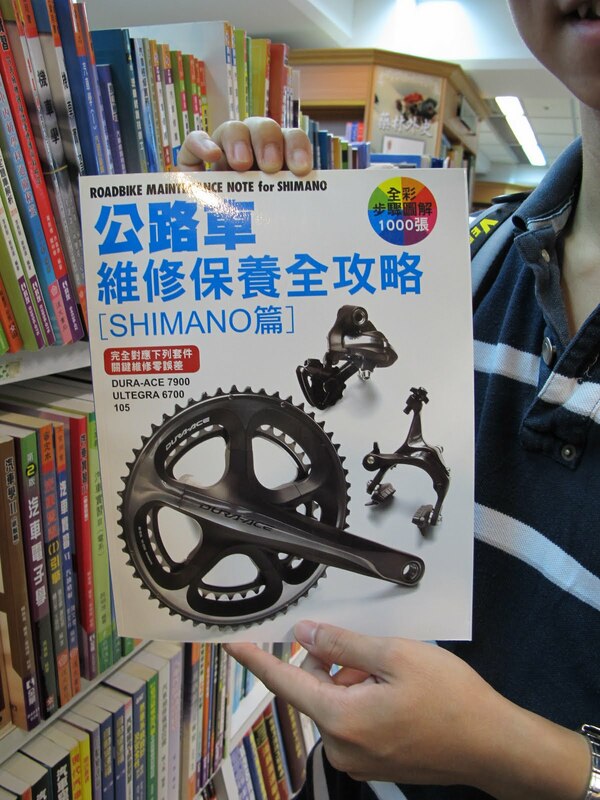 Book on Shimano Road components maintenance! Integrated front and rear lights at La Boutique Du Velo. Carbon mini velo with special wheels at Stripe Magic. I'm going to TW tomorrow with my kids. 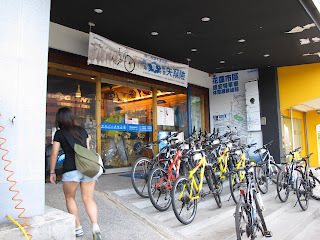 May visit at least 1 bike shop in Taipei. Would you recommend getting anything from TW? Is it worth it to bring a folding bike/min-velo or just accessories/clothes? It's worth getting a folding bike if you know your bike stuff. you will need to check the condition of the bike and tune it, unlike the ones you get locally where the local bike shop will tune everything for you. Accessories there are generally cheaper, and a lot of them cannot be found outside Taiwan, so get them if you like them. Thanks for your prompt reply and advise. I went to Metro near my hotel in Taipei. As they'r having stock-taking, their staff were too busy to help. Some bikes like LG were on sale. But the rest like Pacific Reach & Dahon are on Retail price. Summer Jerseys, shorts were on 50% sale but limited selection. Will definitely go back again to shop. glad to hear that! so what did you get from taipei? @ Richard Chin. Where is the bike shop you found? What hotel is it near? What metro stop is it near? I arrived in Taipei this evening and plan to visit some bike shops tomorrow? I am mostly interested in road/Tri gear and some bike accesories. Thanks for a quick reply. @John: sorry for the late reply. I only managed to visit the First shop on Steve's list. ie 城市绿洲, 104台北市中山區中山北路一段21號1樓 , http://www.hometec.com.tw/. It's a basic Outdoor mountaineering shop with a section on some folding, MTB, clothing. Not much on Road/Tri stuff. You can visit some shop. All the best in your TW bike shopping. I am so glad to have stumbled upon this blog as I been trawling the Internet for info like these w little success. Good job Steve for your sharing. I am heading to Taipei this weekend, would you advice me to get a 20" folding bike from there? 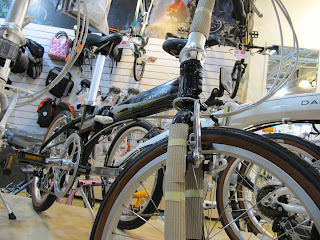 I was looking at the Dahon Dash P18 or MU SL, Tern P18 or Tyrell FX because I wanted a light bike with road components. However prices from MBS is not cheap. My budget is around $1500. What would you recommend to get please? Thank you. you should only get a bike from overseas if you are familiar with the bike you are buying. this is because you will need to check and assemble the bike yourself. for your budget, the Tern Verge P18 would be a good buy, if available. Thanks Steve for the advice. I have more or less decided on the Dahon Dash P18(if I can find) due to the price, design, weight & components or get the older Dahon Silvertip. Tern Verge P18 is attractive but is priced $300 higher locally, heavier & new in the market. Will make a trip to Nehu district if time permits. Hi Veylocity, how much did you pay for the silvertip from Taiwan? Do you know the price of Dash P18 and Dash X20 there? Any good shops to recommend? The Dash P18 is a good bike, fast and light. only downside is that it does not fold compactly. can put in car but difficult to bring on public transport. Most components are easily upgradeable, don't worry about that. Just a little update: Got my Silvertip from Dayu district when I chance upon a local riding a MU Ex. He was very helpful & directed me to a local store. They don't have the Dash P18 but offer me the Silvertip instead. Tmr is F&E day, so I may go accessories shopping at those shops listed here. ahh..nothing like meeting a local who can show you where the good stuff is. The Silvertip is a good bike, with mid-range components. Just ride and enjoy it, and if you feel the itch to upgrade, it can be upgraded easily and be fully customised to your needs. Then I took a bus to Stripe but it was only opened at 1pm! Wasted the whole morning. Had a nice lunch & went to Stripes after 1pm but didn't have much things I could get for my Silvertip...went away disappointed. Worse was that the service wasn't really fantastic... The conversation seems to be one question answered by one word by the guy there...very unfriendly. Heh I guessed you could have checked the opening hours first. The bike shop is not for beginners, it's more for experienced riders who know exactly what they want. When I was there I received good service, the mechanic answered all my queries and spent a lot of time in the storeroom looking for the components I wanted. he even trued the wheelset I bought before packing it in a box. Hi, I would like to go taiwan for a ride. I have a dahon silvertip. which i find its a bit big to transport over. Is it really so worth it to buy a bicycle there (i can do the some knick knack repairs). 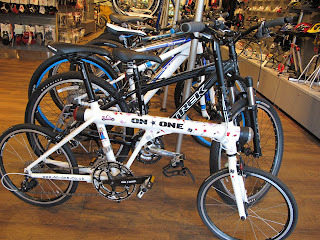 I am looking at either a dahon vitesse p18, vector or speed pro. if not other compact foldies that are cheap in Taiwan. Is it possible to obtain the bike at more than 30% discount? some Dahon bikes there are probably 20 to 30% cheaper, depending on the model and the year. sure you can buy a bike there and ride, but probably not for long distances with a new and unfamiliar bike. note that they may not have the bike you want in stock. anyway way, the silvertip is rather bulky to transport, unless you have a strong reason to transport it, such as for competition. 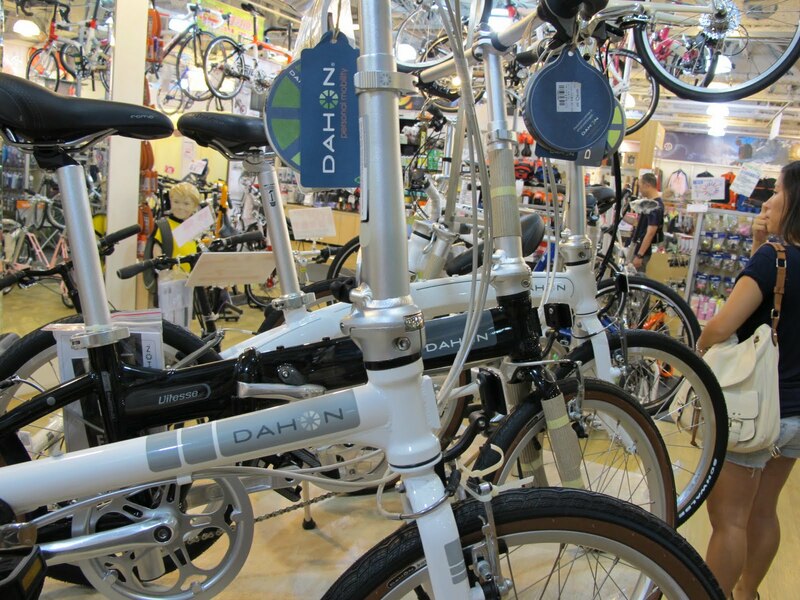 I am going Taiwan next month, and I would like to get a Dahon Dash P18 or Dash X20. Do you guys know the prices? How much did the Dahon Silvertip costs when your were there?? In Taipei now. Would you please suggest two of the best folding bike shops? Hi I am not sure of the stock status of the bikes, if you want you can call them and ask. not sure about the wheel upgrades too, once again you can call or email them to check. 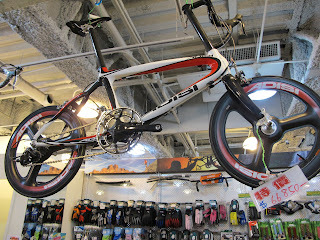 i would like to order giant xtc composite frame from taiwan. can you recomende me one of the shop please! I'm search the online shop from taiwan but not found. I don't think there is an online shop for Giant bikes. you have to either go to Taiwan to get it from the shops or go to your local Giant distributor. 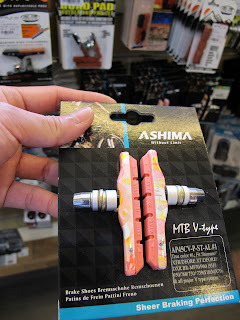 Do you know of any shops that sell MTB stuff like handlebars, stems, pedals etc. etc. ? Full sus frames and such. I went last year Dec and visited 3 shops, mostly in the central area of the MRT. The prices aren't that much different from local shops. No idea about MTB stuff. I only know some shops with folding bike stuff. i went to this shop in near Da An mrt. hsin yi road section 3.
you can find at least 3 bike shops along that stretch. i bought a louis garneau folding bike for nt9900. the boss was a very nice guy! highly recommended. Got to your blog via LCSG. Will be in Taipei for a week or so as a tourist this Dec2012. During this period, would like to buy a foldie for my spouse. It will be a 20" wheel size and most probably either a Dahon or a Tern. 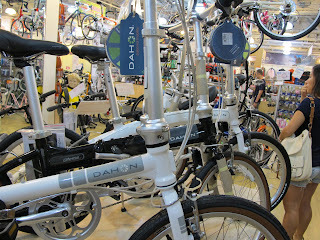 For Dahon, would be looking at the Mu P8 or Mu P24 or similar. For Tern, would be the Link Series D7 or D8 or similar. 01. Which is more conducive to folding and drag along to MRT station and perhaps onto a SBS Bus, in case no choice. 02. Rims and Tyres must be for all weather version. 03. 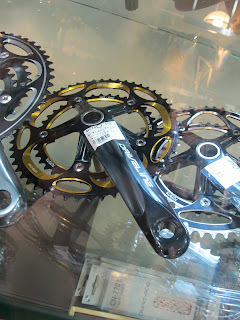 Crank Size to be max out aka preferably 52T if not at least 48T, single crank is OK.
04. Cassette to be mini 7 speed. 07. Possibility of installing mud-guards later if required. 08. Possibility of installing rear rack + touring bag later if required. 09. Possiblity of installing a double kick stand later if required. 10. In your honest opinion, which Model will be the "BEST BUY" (in Taipei) in terms of price range and suitability based on above parameters/guidelines? Lastly, my spouse's height is about 1.52m (52kgs) and since I will occassionally be using this Foldie too, should be suitable for my height of 1.72m (75kgs) too. Currently, I am riding a Mongoose HT. Looking forward to your replies or pointers soon. Thank you. Great to see more people getting interested in folding bikes! For a start, if you are not familiar with folding bikes, I would suggest you buy a folding bike locally. Even though it may be slightly cheaper in Taiwan, you don't have any warranty or after sales service. 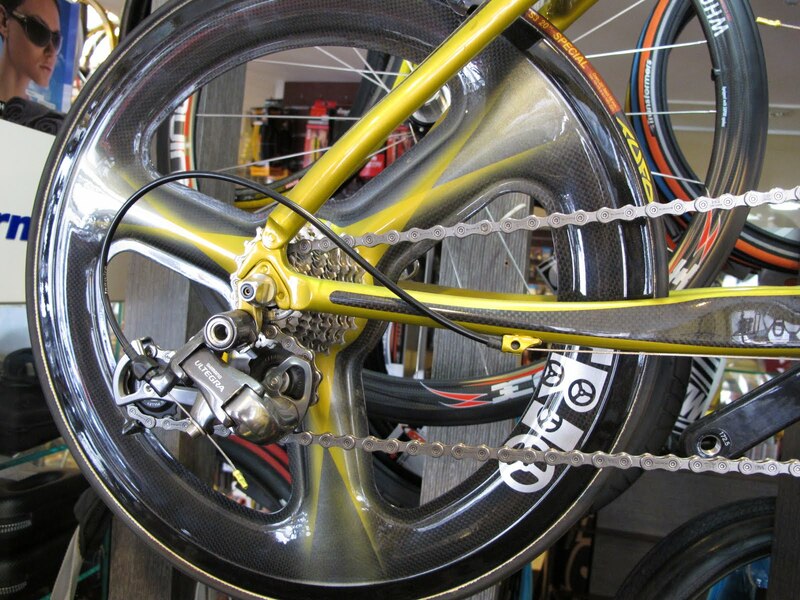 If you plan to upgrade or change some components on your bike later on, it will be much easier to just bring the bike back to the local bike shop, they will gladly advise you and may even do some minor stuff for free. The bike models you listed above all fold similarly, and so will be similar for bringing up public transport. Get at least an 8 speed version, as you can upgrade later on to 9 or 10 speeds without needing a new wheelset. Get the P8 or above series, P stands for premium and D stands for deluxe. The components for the premium models are better than the deluxe models. Same for Tern, the P9 has much better components than D8 besides 1 more speed. The P24 has more speeds, great for touring but will be a bit heavier due to the 3 speed internal hub. I believe all these bike models have ergonomic grips. 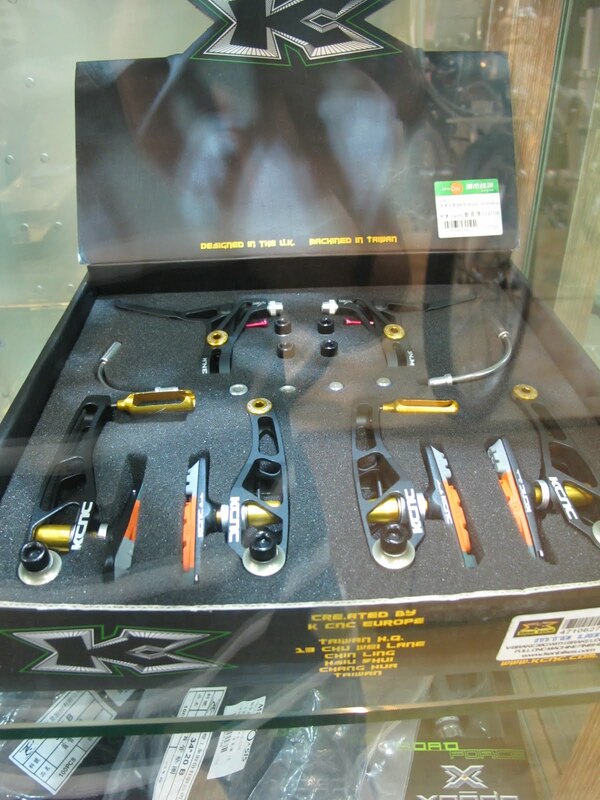 No caliper brakes, except on some models that are marketed as folding road bikes such as Dash X20 and etc. All the bikes can have mudguards and racks, no problem there. Same for double kickstands. For best buy, get the Tern Verge P18. a bit pricey but it does everything you wan. Else get the P8 or P9 model, Dahon or Tern doesn't matter. When you go Taipei, look for accessories or other component upgrades instead of whole bikes, unless you are familar with folding bikes and can service them yourself. First of all, great site!I'm still pretty new to bikes and would like some advice. 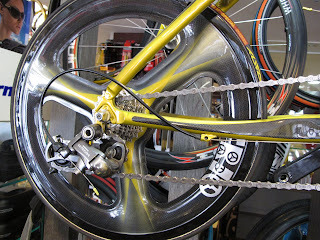 I have a Tyrell FX and am looking to upgrade the shifters and brakes levers. However, there are so many choices out there I don't really know how to choose. 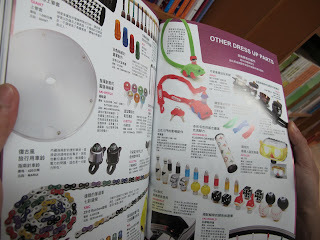 I'll be in Taiwan soon as well and I'm wondering if u have any models of shifters,derailleurs, brake levers u can recommend me to look out for in Taiwan . Hi you don't need to go Taiwan to find those upgrades, they are easily available locally. 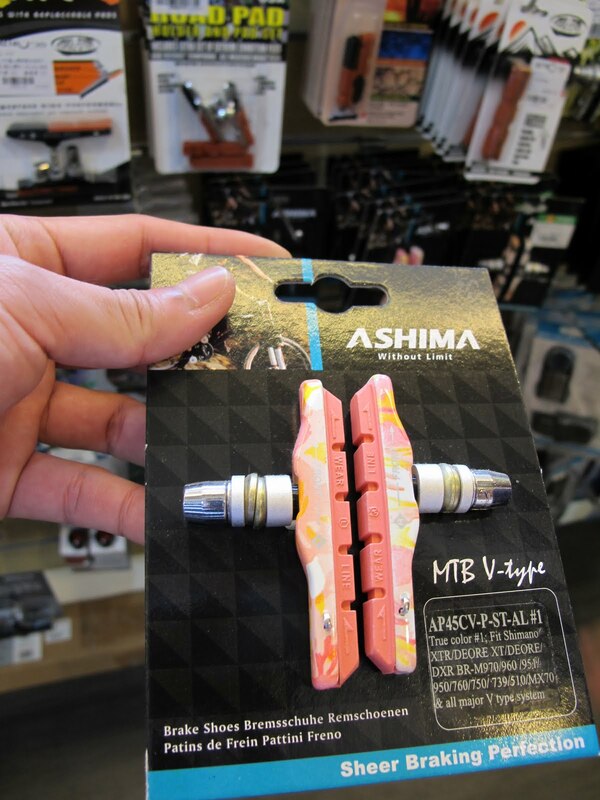 You can go Mybikeshop and they can recommend you something. Would you be able to give direction on how to get to the 3 shops you mention above? It is near the MRT? the shops are all within walking distance of the mrt. just enter the address in google and look for the nearest mrt station. Can you tell me which shop you bought the Wheelsport wheels from and roughly how much they cost? I have a friend going to Taiwan next week and he's kindly offered to bring a pair back for me. I want to provide him with all the info so he doesn't have to visit too many shops and also to avoid him getting ripped off. Thanks! 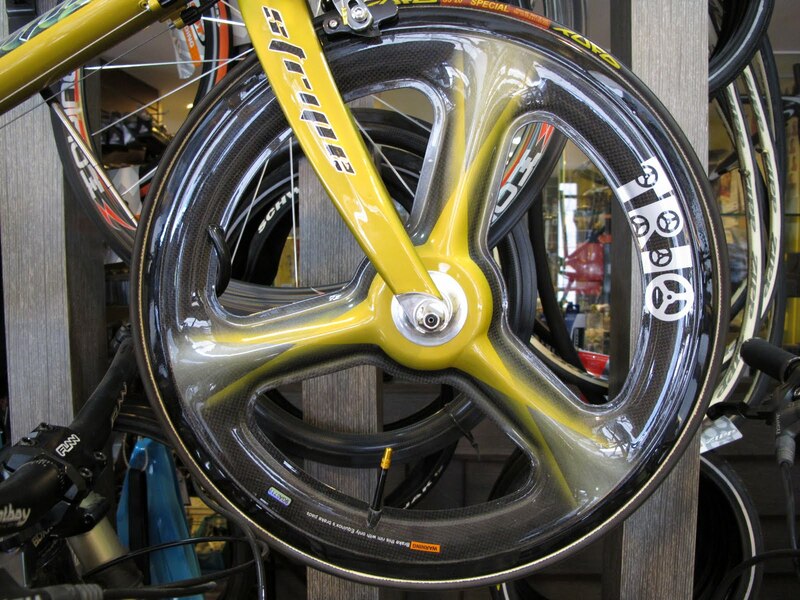 I'm sorry but I cannot reveal the price of the wheels, since the wheels are being sold at MyBikeShop. just get it from MyBikeShop, the price is reasonable and there will be after sales service such as tuning of spokes if there is any problem. Steve, I understand your reluctance to mention a price but can you recommend a sop name. 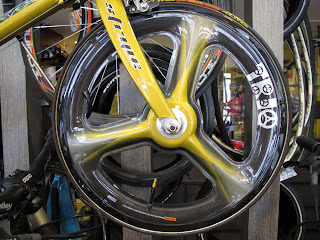 My **** Shop quoted me S$480 for the wheelset which is way too ex. 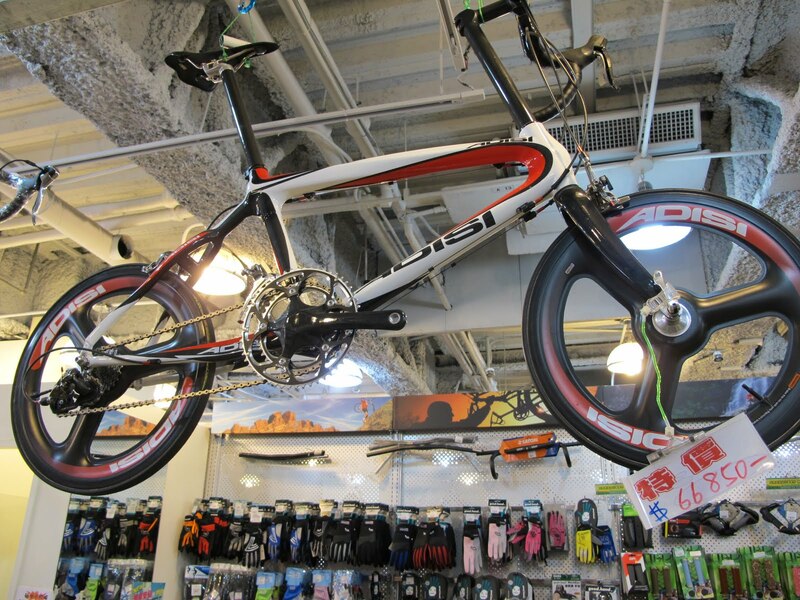 Pity I missed the sales from Urban Cycles when they were clearing stock for S$230. Guess I'll have to get my friend to ask around all the bike shops that he can find in Taiwan. Bro can check with you where do you bought your rear Derailleur adaptor for your broadwalk? Bro Stripe Magic is in Taiwan or Singapore? By the way, if I will to buy a bike from Taiwan. Will I be asked for GST payment at custom? Or anyway to go about this? Bro, Check with you whether getting Dahon foldie from Taipei have international warranty? If yes, how to register? Thanks. I don't think there is international warranty. From what I know, warranty is only local, and for original buyer. If you bring back from Taiwan, you are on your own. I'm planning a month's ride in Taiwan, am stuck wondering if I should buy my touring foldable here or there? Can I write to u direct asking for advice? Are you an experienced rider? Can you fix up a folding bike out of the box? If yes, then there is no problem riding a new bike at Taiwan. Not easy getting used to a new bike, and attempting to tour long distances on a new bike. Really enjoy reading your posts! I wonder if there's a directory or websites for all the bike shops in Taipei?? It'd make life easier to search what one wants, don't you think? Why can't the dealers in Taipei work together to create websites and clubs so to expand their bsiness since Taiwan ia the land of bikes..? Cheers!!! Hmm I have not heard of that bike before, and I have no idea which bike shop carries it. Sorry can't help here. I think some of us rather buy the bikes from Taiwan or Online because of the uncertainty or prices and availability of certain brand/model of folding bikes. Basically, there are only a handful of dealers here which are controlled by local distributors. Most of these bikes are usually available in overseas market but not here. Somehow, here in Singapore, some models are harder to acquire, and thus the fluctuation of prices and who gets to own it? Can't blame the customers if they become distrusting and suspicious of our local operators who somehow get to monopolize the small market here. The Overseas market are more transparent and upfront in pricing and availability. I'm gg to Taipei next week and intends to grab 2 folding bikes back to SG. Can you recommend a reputable shop that deals in both Tern and Birdy. Reason ís because Tern X20 (Me) & Birdy Frog (Wife). I found google and found this shop. 捷世樂 地址:台北市內湖區內湖路1段91巷16號. Any advise? Btw, is there any tax refund at the aiport for the bikes? For Birdy you can try 城市绿洲. Not sure which shop has Tern bikes. Not familiar with the shop you indicated, there are so many bike shops in Taipei itself. Also not sure about tax refund. If you get tax refund in Taiwan and return to Singapore with the bikes, you may have to pay local GST instead. Just get the bikes you want and bring it back normally, should not be a problem. Hi there, we are currently looking for a kid's bike for our little girl who is 7yo this year. 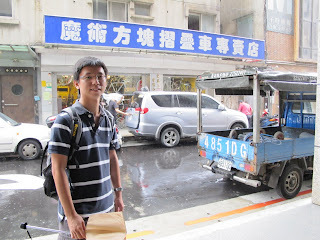 My hubby is arriving Taipei today and staying in Shenkeng Shiang area (Beishen Road). Will you be kind enough to recommend some nearby bicycle shops which are opened on Sundays? Thank you very much in advance. 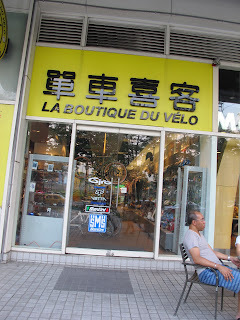 Actually I can't say I'm very familiar with the bike shops in Taipei. On this page I'm just sharing some of my personal experiences during my visit to Taipei. 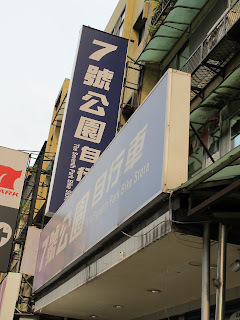 I think the 城市绿洲 shop is open on Sundays, but not confirmed. Monday would be a better time to visit the bike shops. hi! i'm going taiwan in the middle of this year, i was wondering do you know if i could get components cheaper in taiwan compared to sg. 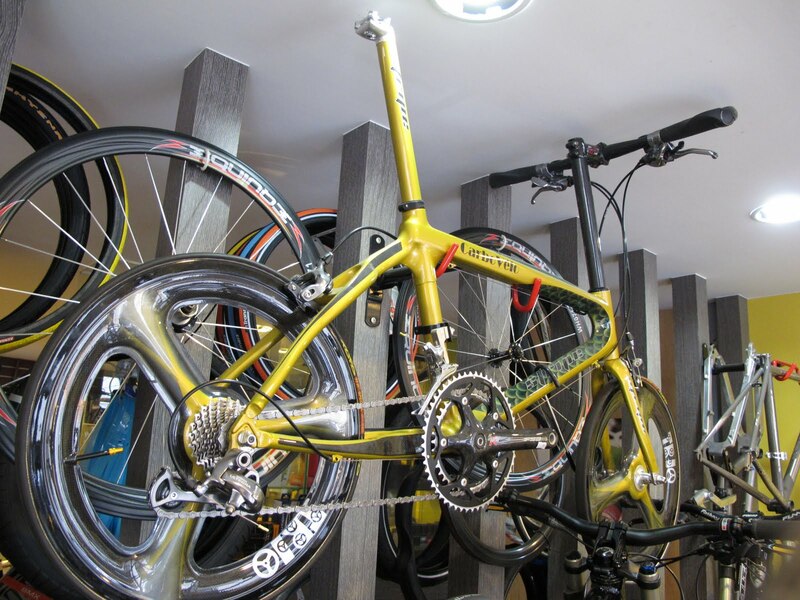 for example a alloy rigid fork? 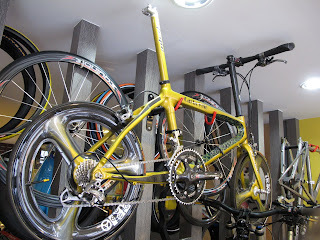 or groupset? Some components will be cheaper, by probably 20%. But it really varies quite a bit depending on the shop you go or the brand. You need to do your homework before you go. Check out the prices locally or online, so that if you find the component in Taiwan, you will know if it is cheaper or not. Got the address and location of Stripe Magic. Many thanks to you. You can check out the Tern P24h. Very similar to Speed TR. Looking for electric conversion, can't find, guess China's popularity hasn't spread to here yet, with all the hills here, one would think it is. Land of the bicycle, but no electric bike or electric conversion kits for purchase any where, weird! I have to go back to USA to buy from sellers who got it from Taiwan in the first place. Disappointing. hello! good morning! i need help. is there anyone who can help me to find a store where can i buy an "A-BIKE with 8-10 inches wheels". i just want to buy two pcs. i'm really having a hard time to find that kind of bike. please, whoever knows where it can be buy, please give me the address and telephone #. thanks in advance! have a nice day. God bless you! Which brand of Taiwanese made folding bicycle do you recommend for parts and service in Less developed Southeast Asia (INDONESIA, Vietnam, Cambodia. Burma, etc)? KHS is good. It uses standard parts that can be replaced easily, and is value for money. Hi, I intend to shop for a KHS F20-t3 in Taipei next week. Could you advise which shops to go that sell KHS folding bike? Hi, I am planning to shop for the KHS F20-t3 in Taipei. 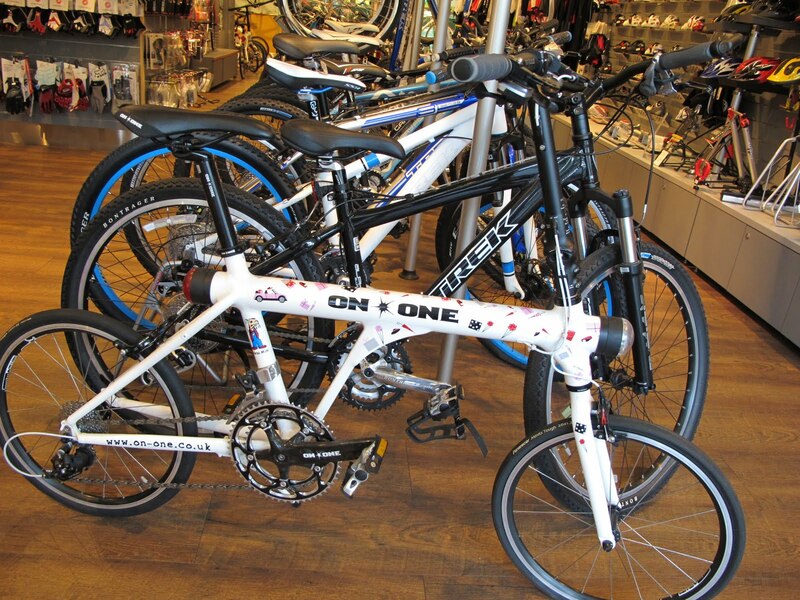 Could you advise which shop to visit to look for KHS folding bike? Hmm I'm not too sure, you could try to check online to see where are the dealers for KHS bikes. 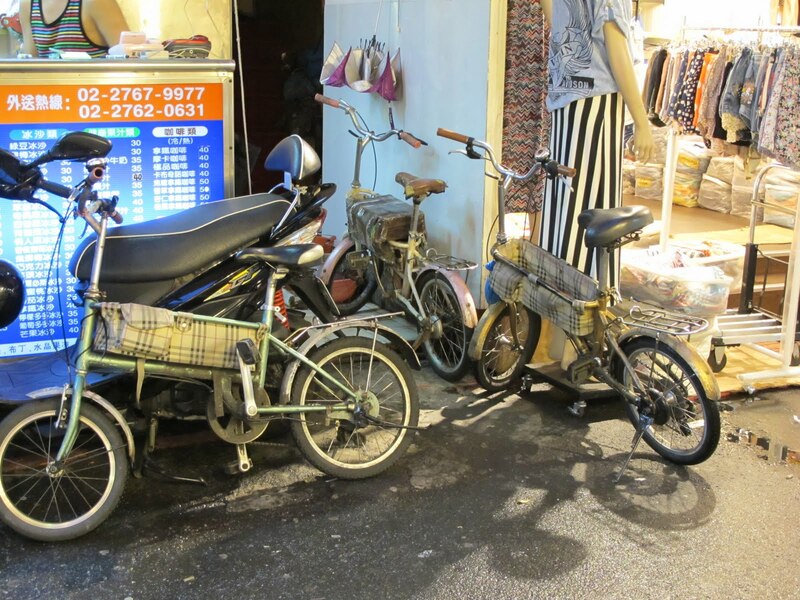 I am interested in importing used (second-hand) bicycles from Asia. Can Taiwan be an option? Are there shops for used ones? Thanks! 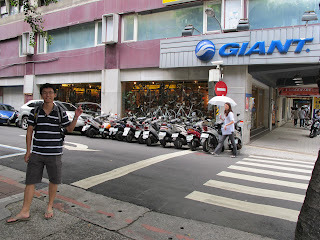 The shops in Taiwan mostly sells new bikes. Go to the first shop listed in this blog post. They have lots of cycling wear and accessories. You can check out Big Box at Jurong East, there is a good selection of kids bikes. Would someone have a list of stores selling Birdy folding bikes, and accept orders from overseas? Is it true that same model/ brand cycle are cheaper in TW? if yes, how I can buy a model from there and get it shipped to India? 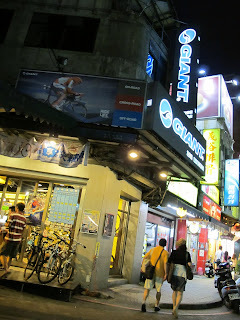 Taiwan brands such as Giant or Merida are cheaper in Taiwan. Probably need someone to buy it on your behalf and ship it over. No there are no cheap copies. It is difficult to copy the folding of the Brompton as the design and manufacturing requires high precision to fold properly. New way of folding your Dahon bike!